UPDATE: This sale was scheduled to start on Tuesday May 9th, but has been rescheduled to start on Wednesday May 10th. 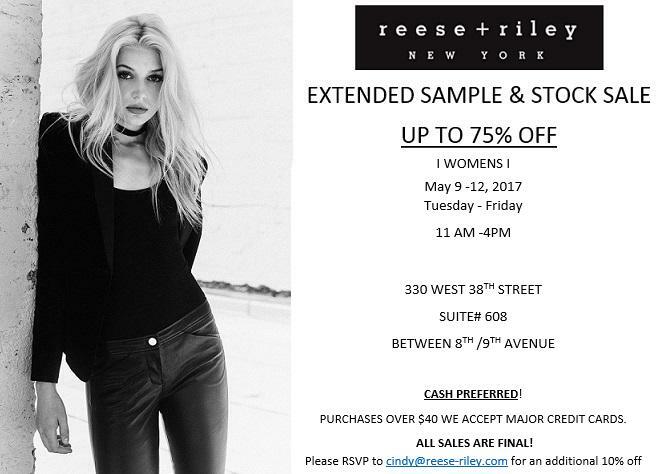 This Extended Reese+Riley stock and sample sale is continuing and has up to 75% off womenswear - plus RSVP to cindy@reese-riley.com for an additional 10% off! Cash preferred but major cards accepted too on purchases over $40. ALL SALES FINAL!